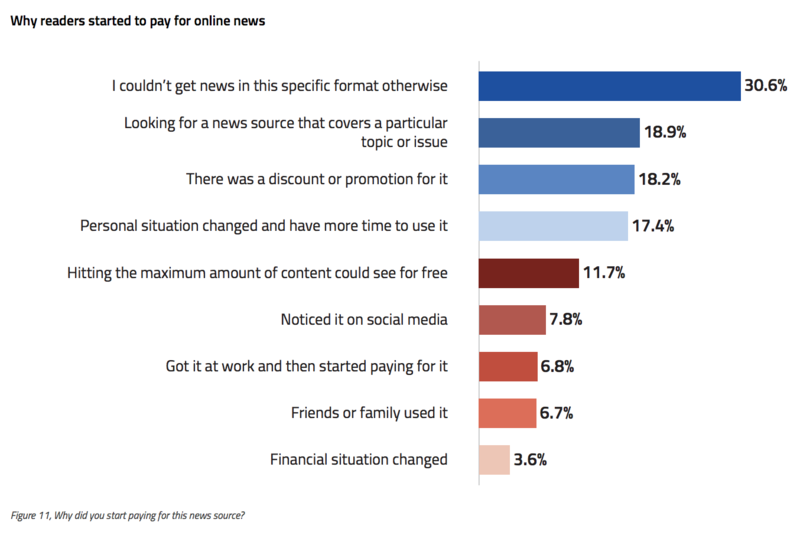 What is the biggest benefit of paying for online news? Digital publishing firm Twipe surveyed nearly 4,000 people from six European countries and the U.S., and found that the most-cited reason for paying is unlimited access to stories — followed by, uh, access to print (with feeling good about paying for news quite a bit further down). Most of the people surveyed also spend between 5 and 20 minutes per day consuming news, so it’s not as if they’re reading everything they have access to, but the “all you can eat” feeling is appealing — knowing you could read it all if you wanted to. 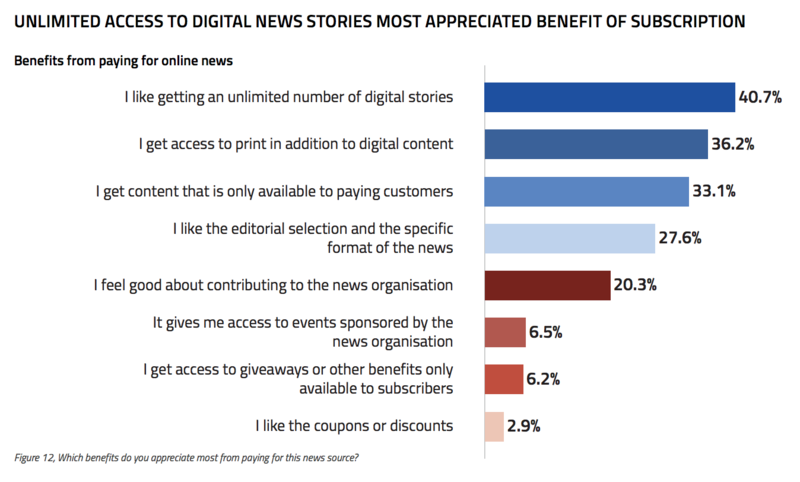 Interestingly, while those surveyed cite unlimited stories as a big benefit to paying for digital news, few of them (11.7 percent) said that hitting the paywall was the main reason they started paying up (though “couldn’t get news in this specific format otherwise” may refer to payments as well). Owen, Laura Hazard. "Readers say that the best thing about paying for digital news is freedom from the paywall." Nieman Journalism Lab. Nieman Foundation for Journalism at Harvard, 15 Jan. 2019. Web. 20 Apr. 2019. Owen, Laura Hazard. "Readers say that the best thing about paying for digital news is freedom from the paywall." Nieman Journalism Lab. Last modified January 15, 2019. Accessed April 20, 2019. https://www.niemanlab.org/2019/01/readers-say-that-the-best-thing-about-paying-for-digital-news-is-freedom-from-the-paywall/.